Ashley Fuller Olsen (born June 13, 1986) is an American fashion designer, producer, author, businesswoman and former actress. She co-founded luxury fashion brands The Row, Elizabeth and James, and the more affordable lines Olsenboye and StyleMint with her twin sister Mary-Kate Olsen. She is also the older sister of actress Elizabeth Olsen. Ashley was born in Sherman Oaks, Los Angeles, California, the daughter of Jarnette "Jarnie", a personal manager, and David "Dave" Olsen, a real estate developer and mortgage banker. Along with her twin, Mary-Kate, they have an older brother, Trent Olsen, a younger sister, Elizabeth Olsen who is also an actress, and younger half siblings Taylor and Jake from their father's second marriage. [ Olsen's parents divorced in 1996. The twins and their siblings have Norwegian ancestry on their father's side. 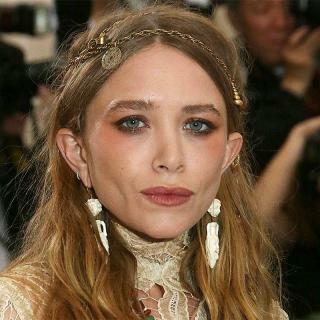 Olsen began her career at the age of nine months old, when she and Mary-Kate were hired to share the role of Michelle Tanner on the popular television series Full House in 1987. Following the end of Full House, Olsen released a string of successful straight-to-video movies and became a popular figure in the preteen market during the late 1990s and early 2000s. She became a household name, with her likeness seen in clothes, books, fragrances, magazines, movies, and posters, among others. There were fashion dolls of her made by Mattel from 2000 to 2005. She starred in the video series The Adventures of Mary-Kate & Ashley, the ABC show Two of a Kind, and ABC Family's So Little Time. She and her sister were jointly ranked number three on the VH1 program 100 Greatest Child Stars. In 2004, the twins appeared in the theatrical light-hearted romantic comedy, New York Minute. In 2007, when Mary-Kate and Ashley were 21 they said that if they got involved in movies together again it would be as producers. When asked about acting again in 2009 Ashley said, "Never say never." In 2009 Olsen contemplated returning to acting. She changed her mind and in 2012 the sisters decided to quit acting permanently and focus on fashion. In October 2013, Olsen appeared in the music video for "City of Angels" by Thirty Seconds to Mars. Nickelodeon acquired the rights to Mary-Kate and Ashley's video library in 2015. In 2015, it was announced that John Stamos had signed on with Netflix to produce and co-star in Fuller House, a spin-off Full House that would reunite the original cast members. Mary-Kate and Ashley originally announced in May that they would not reprise their role as Michelle Tanner, however in July, according to Netfix's Ted Sarandos, the Olsen twins were "teetering" on an agreement to join the series. In 2004, both Ashley and Mary-Kate Olsen became co-presidents of their company Dualstar (created in 1993 following the success of Full House), the brand currently selling in over 3,000 stores in America and 5,300 stores worldwide. Their success has been marked on Forbes' The Celebrity 100 list since 2002. In 2007, Forbes ranked the twins as the eleventh-richest women in entertainment, with an estimated combined net worth of $300 million. Following a high volume of public interest in their fashion choices, both worked in collaboration on a string of fashion lines available to the public. They started a clothing line in Wal-Mart stores across America for girls ages 4 to 14 as well as a beauty line called Mary-Kate and Ashley: Real Fashion for Real Girls. In 2004, they made news by signing a pledge to allow all the workers that sew their line of clothing in Bangladesh full maternity leave. The National Labor Committee, which organized the pledge, later praised the twins for their commitment to worker rights. The idea for The Row started as a personal project in 2005 when Ashley Olsen challenged herself to create a perfect T-shirt. She tested the design on a variety of women of all body shapes and ages in an attempt to find a "commonality in fit and attitude." By 2006, the sisters had created a 7-piece collection that included the T-shirt, a pair of cotton sateen leggings, and a cashmere wool tank dress. Barneys New York bought the entire first collection. The brand has expanded to include ready-to-wear, resort, handbags, sunglasses, and shoes. In 2006, they were tapped as the faces of the upscale fashion line Badgley Mischka. As adults, the Olsens have devoted much of their attention to the world of fashion. They head a couture fashion label, The Row, as well as the Elizabeth and James, Olsenboye, and StyleMint retail collections. Ashley Olsen has appeared on best-dressed lists. The Olsens designed an Olsenboye Change Purse in 2011 and donated the money to "Pennies From Heaven". In 2011, the Olsen sisters teamed up with TOMS Shoes to design footwear for kids without shoes in more than 20 countries worldwide. Mary-Kate and Ashley are now the creative directors for the Italian brand Superga. The Olsens released an Elizabeth and James perfume in early 2013. StyleMint is now available in the UK. In October 2012, Ashley and Mary-Kate won the WSJ magazine Innovator of The Year Award. Ashley and Mary-Kate won the top prize at the 2012 CFDA Fashion Awards. Ashley with her twin was nominated for Council Of Fashion Designers in 2015. In 2008, Mary-Kate and Ashley Olsen wrote Influence, a book featuring interviews with fashion designers that have inspired the Olsens' fashion lines. In 2005, Olsen filed a $40 million lawsuit against tabloid magazine National Enquirer for depicting her as being involved in a drug scandal. Her case was dismissed by a federal court in Los Angeles in November of the same year. In May 2004, Olsen and high school sweetheart Matt Kaplan split up after three years of dating. In May 2008, Olsen began dating fellow actor Justin Bartha. They split up in March 2011 after almost three years of dating. As of January 2014, Olsen has been dating film director Bennett Miller.